Footlights’ strength is its membership, not in numbers, for we are still short of 40, but in its versatility and determination to produce shows of a high standard—and enjoy life to the full. In recent years we have seen an influx of very enthusiastic young people. This has greatly enriched the composition of our membership, with talented young performers mixing in with experienced stagers. And we have now set up our own Youth Theatre Group. We are always on the look-out for new talent, be it on or off stage, and it is a chance to make new friends and enjoy the social life that goes with being in a group with common interests. Contact us! Anyone wishing to audition for one of our shows must be a paid-up member of Footlights. In other words, they must have paid their subscription before auditioning. The audition panel is normally made up of the Director, the Musical Director, and a committee member. 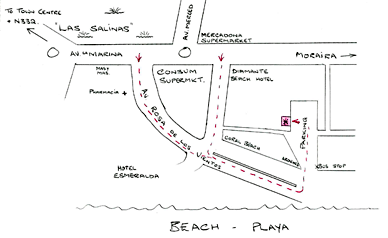 Rehearsals for the whole cast are on Thursday evenings, at the Footlights Centre in Calpe (see map below), from 7:30 onwards. Principals may also be called for rehearsals on Monday evenings. The committee ask members to submit suggestions for shows. Once these are in, we hold several discussions at committee level to establish their suitability. We take into account such things as how we can make best use of our established membership, how much it is likely to cost to put the show on, and whether permission would be given to perform it. Once we have chosen a show, the committee appoints a Director and a Musical Director, and we start working on dates and places. Many groups, theatrical or otherwise, owe their origins to a conversation or a casual remark made over a drink. Footlights is no exception and from the first little acorns grew a whole copse of flourishing oak trees. The aims at the outset were to enjoy a lively social life, to put on a major production every year, and to raise money for local charities. We asked for subs on the first night to enable us to pay for the meeting room in Calpe. Because we had no funds, the group immediately set about fund raising, by having a stall on the local rastro, social events, requesting patrons for support, and running raffles. The first show was an old time musical “All for your delight!” Since then the Group has gone on to produce annual major musical productions.We have even performed twice at Benidorm Palace. You can find out about all these productions on our Past Shows page.